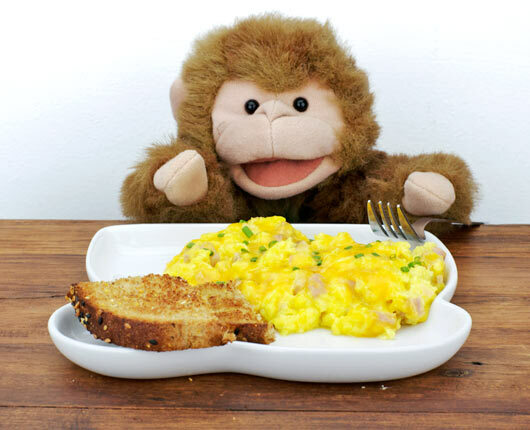 Here's a recipe so easy that a monkey could make it... quick scrambled eggs for those mornings when you don't have time to monkey around. It was originally submitted to the site by teens Sarah and Erica in 2004. It's now 2013. Sarah and Erica are no longer teenagers and I finally got around to testing and photographing the recipe. I liked it! I would advise reducing that cheese to at least 1/2 cup unless you want Super Indulgent Cheesy eggs. I used about 1/3 cup cheese, cut the milk to 2 Tablespoons and topped the completed dish with a sprinkling of chopped chives. If you're looking for a quick recipe where you throw everything in bowl, mix, fry and eat... this is a decent one. Fast and easy. No monkey business. 1. Crack the eggs in a bowl. 2. 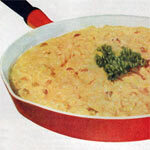 Mix in ham, cheese, and milk. 3. Beat with whisk or fork. 4. Pour in a greased pan (spray pam on it). 5. Turn on stove on high heat. 6. 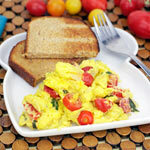 Mix the eggs every 1 or 2 minutes. 7. 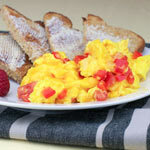 Lower heat to low setting (if eggs are cooked to your likings, turn off stove and pour onto plate). 8. Cook until it's to your liking. Pour on plate when finished. Recipe from teenagers Sarah and Erica. 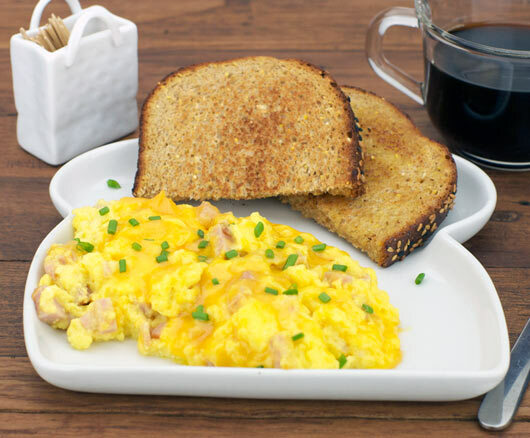 It's a simple ham and cheese scramble that anybody can make. 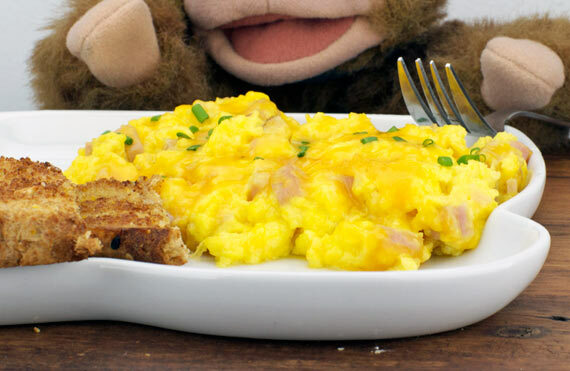 Mr Breakfast would like to thank jwlrles for this recipe. 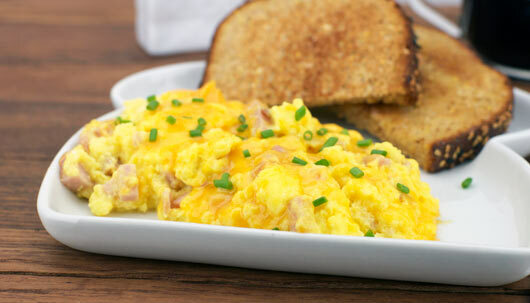 What do you think of Cheesy Ham Scramble? I made this today. I used the ingredients as per recipe but added a very large diced tomato. I guess most veggies or meat could be added to sharpen the flavors and a dash of Worcester sauce gives an extra bite. Delicious! I threw in 2-3 diced sausage links and after cooking added some rooster (chili) sauce. Quite amazing. Wish I had bacon too :p.
I used cheddar cheese and added a little chopped onion. 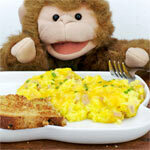 This recipe also needs a pinch of salt in the beaten eggs. And the milk should just be 2 tablespoons. Good simple recipe. 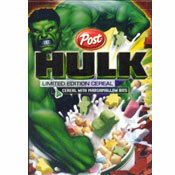 Top it off with a nice Cheddar cheese and it's good stuff.